Accepted Scientific Name: Echinocereus viridiflorus subs. correllii (L.D.Benson) W.Blum & Mich.Lange in W.Blum et al. Habitat: It grows on red soil in a warm to hot and dry climate. 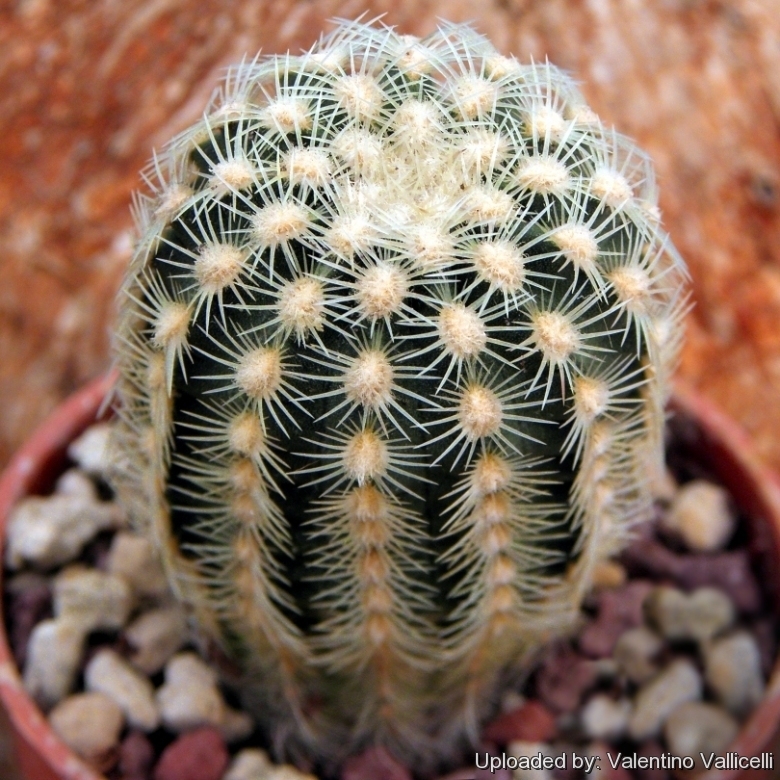 Description: Echinocereus carmenensis (a.k.a. chocolate-scented hedgehog) is one of the innumerable local form of the very variable Echinocereus viridiflorus that distinguishes for the stocky body covered by tight yellowish pectinate spines and for its very peculiar chocolate-scented flowers. Some immature seedlings are covered with, white, flexible hairs somewhat like Echinocereus viridiflorus var. neocapillus. The yellowish-white spines are produced only when plants attain an height of 2-3 cm. Bases of older plants often show belt of white wool, with typical spines above. But not all seedlings shows this hairy phase. Stem: Spherical to shortly cylindrical, but usually more compact than in Echinocereus viridiflorus, erect, pale or yellowish-green. Areoles: Oval to elongate covered with much white or yellowish wool when young, bare when old except for very small tuft at upper end of areole where flower is produced. Spines: Partially or mostly obscuring the stem, often crowded, interlocking with spines from other areoles, needle-like, usually all radial, but mature specimens may occasionally produce a single dark reddish-purple central spine 1-1,2 mm long. Radial spines: 25-30 or more, tightly appressed, evenly radiating around the areoles and more or less pectinate, creamy-white to clear yellowish, glassy, the upper ones thin, shorter and weaker 2-3 mm long, length increases around areole; laterals to 6 mm long, lower ones slightly shorter, straight or slightly curved. All the spines has a bulbous base but usually covered, until they are very old, by the wool of the areoles. Flowers: Diurnal, with a very unusual chocolate scent, produced on lateral mid stems, but sometime lower, very similar in colour and shape to those of Echinocereus viridiflorus var. chloranthus, funnelform, not opening widely, 25-32 mm long, 15-25 mm in diameter, yellowish green to bronze-green. Filaments pale yellow or greenish. Anthers cream coloured or yellow. Stile greenish with 8-10 dark green stigma lobes. Cultivation and Propagation: In culture it is without problems and regularly shows its small greenish flowers if we provide an adequate winter rest period. They are re small plants with scented flowers that are better close to nose level. Displaying your cacti on shelves has the added benefit of keeping them off the ground and away from potential rodent or snail damage. Hardiness: Keep drier and cool in winter. Very cold resistant hardy to -10° C or less for short periods of time. Propagation: Seeds or cutting (if available). Seeds germinate in 7-14 days at 21-27° C in spring, remove the glass cover gradually as the plants develops and keep ventilated, no full sun for young plants! The seedlings should not be disturbed until they are well rooted, after which they can be planted separately in small pots.